1. State registration number of the theme - 0111U000673, NTUU "KPI" - 2468-p.
2. Scientific leader - prof. Dugan Oleksiy M.
Multiprobiotic drug was created on a base of 5 strains of bacteria p. Lactobacillus. The product is characterized by high antagonistic activity in point of pathogenic and conditionally pathogenic bacteria, ability to adhesion of epithelial cells of the intestinal mucosa and resistance to aggressive gastrointestinal mediums. Probiotic is showed antimutagenic and antiherpetic activity, immunological regulations and involved in metabolism of bile and gonadal hormones. The mechanism of this drug action have been extended due to addition of karbyulose (plant origin component), which has the ability to absorb of heavy metals and radionuclides. The interactive method for identification of the potential therapeutic activity of drugs have been developed. A database of probiotic strain cultures for screening of prophylactic and medical preparations has been created. This database can be used for creation of preparation with directed therapeutic effect. Due to using of interactive method the potential biotherapeutic activity of probiotic and karbyulose has been studied. Technological conditions for cultivation of industrial strains, the optimization of the fermentation medium have been elaborated. Medium composition on a base of soy milk for lactic acid bacteria growing has been proposed. 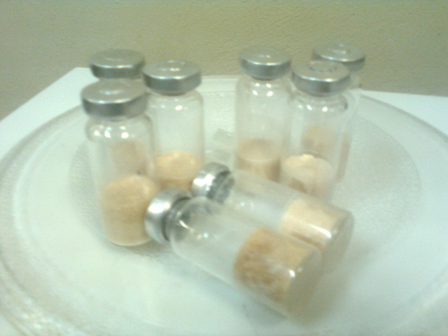 Such medium can be effectively used in the technology of food additives and food functionality. Possibility of using karbyulose as cryoprotector for freeze-dried lactic acid bacteria is investigated for the first time. The composition karbyulose-containing protective mediums for drying which provide a high rate of survival of probiotic cultures. This medium is much cheaper than the standard medium analogue. Technological regulations project of capsulated forms of complex drug was elaborated. Implementation of the project includes cultivation processes of five lactic acid bacteria industrial strains and using as cryoprotectants karbyulose-containing medium for drying. The project the methods for industrial producer are presented, considered characteristic of the final product, given characteristics of materials and raw, technological process are described with given points and control parameters necessary to ensure preparation quality, selection of modern equipment and devices for technological production drags of probiotic group.